ECC offers both commercial and residential heating and AC (HVAC) sales and service. ECC is located in Dacula, GA and we service all surrounding areas in Metro Atlanta. Call 770-544-8761 to schedule service or for any questions you may have, or click the button below to complete our online service scheduling form. Efficient Cooling Concepts, Inc. is here to help you with all your Heating and AC (HVAC) service needs. We will diagnose your entire house or business and recommend solutions that will provide you and your family with the most energy efficient home possible. Whether you need your air conditioner serviced or replaced, or complete heater replacement services, ECC is here to help. We offer quality installation, repair, and maintenance services for businesses and homeowners. ECC services all your Air Conditioner and heater repair (HVAC) problems in Gwinnett and surrounding areas including Dacula, Buford, Lawrenceville, Loganville, Snellville, Suwanee, Duluth, Norcross, Winder, Grayson and Loganville. To schedule your residential or commercial HVAC service, call 770-544-8761 or complete our online service schedule form. These Guys are the BEST! I called them on Monday to share my malfunctioning air conditioner story. ECC informed me that my Goodman unit was still under warranty for parts. My first A/C repair person kept telling me to install a new unit for $4200 and never asked about the age or warranty of the existing unit. ECC gave me some options and sent someone out that same morning. David arrived promptly, did a search on the leak, diagnosed the issue, located the replacement parts, came back the next day to install. David, Blake and Robbie repaired my A/C unit and now I'm happy again! The customer service is AWESOME! I finally have a great A/C company to call in the future and now I can refer them to my friends and neighbors. Thanks again!! David Evans is an amazing AC repairman. I thought I had to pay $1700 after another company reviewed my unit. But after David worked on the unit bc I got a second opinion from him, he showed me the obvious problem and I paid $150. I will never use another company or repairman. This man has a 6th sense for AC units. All these 5 ratings are the truth. Making my initial appointment was a breeze and the ladies in the office answered all my questions cheerfully! David and Blake with Efficient Cooling Concepts were extraordinarily! They were able to work around my busy schedule even when I called at the last minute to reschedule, they were prompt and respectful. They took time to explain our problem and pricing was very reasonable! My air conditioner unit upstairs stopped working and I found out at about 4:30 Wednesday evening. I called and no Techs was available that evening so Stephanie scheduled me for the next day at 4pm. She then called me back and said she had been able to speak to a tech who could get to me at 8am the next morning. I really appreciated her extra effort to accommodate me. Robby showed up on time the next morning and he was very professional and friendly. He told me each time what he was doing. I would definitely use them again and recommend them. Temperature settings depend on the time of year and your personal preferences. In the summer, the average temperature setting is 73°- 80°. In the winter 68°- 72° is the norm. Remember, when leaving your house; try to avoid drastic temperature changes. Do not set your temperature back more than 5°; this will cause your unit to work harder to achieve the desired temperature setting. Bigger isn’t always better; its performance and efficiency that count. Before purchasing a replacement system you should always make sure your system is sized properly to match your needs and budget. Your ECC specialist will thoroughly assess your home and comfort requirements to determine the proper size and make the appropriate recommendation. Is it making strange noises? Is it cooling or heating all areas of your home sufficiently? Has it been taking longer to cool down or heat up? Have your utility bills been rising for no apparent reason? Any of these are signs that you may have a problem that needs service. In most cases, the longer you delay, the worse any underlying problems will get. So be sure to contact ECC to check out your system whenever you notice anything out of the ordinary. In general, ECC recommends that you replace your disposable filters at least once every three months, as the season changes. If you have washable filters, they should be cleaned once a quarter. 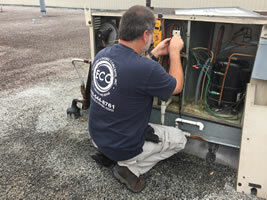 Your ECC service technician will recommend a replacement schedule that delivers the optimum efficiency and filtration for your specific system. With an ECC PM Service Plan, we clean and inspect your HVAC system twice each year. Part of the service includes changing the filters or servicing your filtering system. Unless you have special circumstances, our service should be adequate. We recommend that you visually check filters and filtering equipment monthly. If filters look dirty, they need to be cleaned or replaced. Should I try to keep my air conditioning system from running too much? Generally speaking, a unit that is either on or off is less expensive than one that keeps cycling on and off repeatedly. Every time your system starts up, it will use a lot of electricity and not produce much cooling. That’s why a smaller system is often more economical to operate: even though it runs nonstop and may deliver less comfort, it will usually consume less power than a larger system that cycles on and off. We are located in Dacula and we service all surrounding areas. Serving Snellville, Dacula, Lawrenceville, Grayson, Buford, Lilburn, Braselton, Houschton and surrounding areas. © 2019 ECC-HVAC | Design by: Abysmal Blue, Inc.